Hey everyone. Today marks the day of 1 month until my wedding and I was thinking I'd like to clean out my closet soon before that happens. I've got designer jeans, coach purses, and size 4 and up shoes. Maybe this money can go toward my honeymoon, as I just had my college graduation and am yet a poor woman. :) Let me know what you guys think about the idea. I know it could be nice for those of you who have difficulty finding petite clothing. Speaking of graduation, I wanted to share with you my graduation outfit, FOTD (face of the day), and graduation silliness. My outfit was a white knee-length dress with red pattern and piping. The sweetheart neckline accentuates the bust while the high waist band narrows the waist. I flipping love this dress! And of course, white heels. And here's a couple more of me being a ham. Yay graduation! Anyway, things have been super busy lately but let me know about if I should sell things! Also, as a side note, I went to MAC and got my foundation shade. I'm NC 30. 25 on much of my face, but 30 on my forehead and body. I'm so excited for you lol. You look great as usual~!! Looking forward to your upcoming reviews and tutorials. I'm guessing he's a hot shot champion winning basketball player! Look how tall he is! I have a picture somewhere with a champion basketball player too. I went to UF, where the boys won back to back championships! Hehe, again you look beautiful! Congrats on graduating! You look so lovely! Congratulation on your graduation! Is that UCSD? If it is, go triton (I also graduated from UCSD)! i would love to see wedding pictures and all the preparation before hand. :) congratulations, once again. hope everything is perfect and lovely. i would love to see what you have to sell. and about your fotd, i think the eyes are lovely, but maybe a lighter lipgloss/stick would be nice :) but it's all pretty. and maybe you can do more skincare posts. i love those. jeans that fit are hard to find, so depending on what you have for sale i might be interested. i wear a size 0. Congrats on your graduation! I've been reading your blog for a while but never commented until now. Great posts! The makeup looks great... Keep on posting! I keep looking at your pictures and I can not believe you are 4'10". You don't look like it at all! (Belated) congratulations on your graduation and congratulations on your wedding! OMFG you are so breath-taking!!! so gorgeous, wow! you look completely amazing, i'm so jealous!!! the hair and makeup looks so fabulous! congratualations!!!! 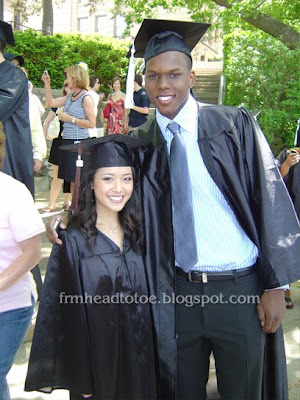 you looked gorgeous on graduation jen! i need to call you soon! hi! a quick question.. do people ever notice your double eyelid tape.. and have people in school seen you with and without the tape?? I want to use the eyetalk, but my only concern is (sadly) what people think of me. i mean.. im in college right now.. and my friends would find it weird that i'm using it. ^^ thanks so much everyone! It feels good to have the ceremony, and to look forward to bigger, better things! gee: You are right. He is a hot shot championship winning bball player. but before this pic I think he was so hot shot he was busy hitting on my classmate. Haha. anonymous: I have never had anyone ask about my eyelid tape or glue. I make sure my makeup is heavier (thicker liquid liner) so it covers the shiny tape, and with glue I like to keep it light. The only time I feel self conscious is when I'm around Asians but even then my cousins couldn't even tell I was wearing it, they just complimented my makeup! But i would like to try using glue as i find tape abit too noticeable especially when i use shimmery e/s. Is your Koji glue pink/blue bottle? Jen, this dress is gorgeous! Where did you get it from? I love your style. 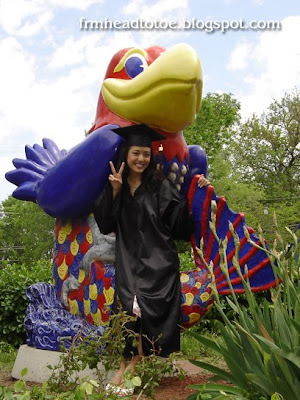 OMG I saw the jayhawk sculpture and was like 'NO WAY SHE WENT TO KU???!!" ahh my home state <3 I knew you were from the midwest but didn't know you were specifically from Kansas too. Yay KS! !